Fear of trade overlooks that most value creation in advanced economies is based on services, not manufacturing. Trade typically figures prominently in US presidential election, and 2016 is no exception. While campaigning, politicians tend to adopt anti-international business positions that are theoretically unsound and lack empirical evidence. Four fallacies underline these common political arguments. Fallacy 1: Manufacturing jobs are the basis of American prosperity. Fallacy 2: Imports make us poorer. Fallacy 3: Success of foreign firms always helps foreign countries, success of US firms always helps the US economy. Fallacy 4: To export, firms must sell to buyers in foreign countries. The manufacturing fallacy: Since 1980, elections have included clarion calls to bring manufacturing jobs back to America. President Barack Obama focused on reviving the manufacturing sector, and in the current election, Donald Trump vows to revitalize manufacturing to “reclaim millions of American jobs” while Hillary Clinton has promoted a “make it in America” strategy on the stump. Yet manufacturing continues to shrink as a percentage of total employment. By some estimates, while US manufacturing output increased sixfold between 1950 and 2008, the share of manufacturing jobs as a percentage of all jobs decreased from about 30 percent to 10 percent. The reduction in the share of manufacturing jobs despite a significant increase in manufacturing output is primarily due to tremendous productivity gains since World War II, stemming from continual innovations in technology and management practices. This is neither new nor unique to the US. According to the US Department of Agriculture, the share of US farm sector employment fell from 90 percent to about 10 percent between 1790 and 1950. This was due to increased use of heavy machinery and automation, and a simultaneous migration of labor from the farm sector to the manufacturing and service sectors. Furthermore, all major industrialized nations have experienced job losses in the manufacturing sector. Political arguments often neglect the underlying structure of different economies. Most advanced economies have become primarily service economies. As the structure of the US economy has changed, so have its drivers of value creation. Advanced economies add greater value by focusing on non-repetitive, high-value-added specialized activities such as innovation and marketing, while emerging economies concentrate on repetitive, low-value-added standardized activities. Rich countries are service economies, focused on finance, engineering, design and health care, and this is dictated by their comparative advantage. The import fallacy: The second popular myth is that imports make a country poorer, and a country must export more than it imports to be prosperous. There are two major problems with this view. First, merchandise trade deficits per se, when countries import more goods and services than they export, are not detrimental to economic growth. Basic economics tells us that merchandise trade deficits must be offset by capital account surpluses because every country’s balance of payments must be zero by definition. Simply put, imports must be paid for with current goods, or exports, or past accumulations or future goods – capital. As long as the domestic economy is an attractive destination for foreign capital, a country can afford to run deficits. Thus, an innovation-driven economy, such as the United States, can support trade deficits year after year, by way of an inflow of foreign capital. Foreign investment also brings benefits for the domestic economy, including more and higher paying jobs. In the long run, the only way to reduce trade deficits in a healthy manner is to encourage savings. Restricting imports only weakens the domestic economy. Further, imports and exports go hand in hand. The top export destinations for the US – Canada, the EU, Mexico and China – are also the top locations from which the US imports. Likewise, the top exporting states – Texas, Illinois, Kentucky, and Michigan – are also top importing states. The mechanics of this correlation are illustrated by Boeing, the largest single US exporter, and its most recent export success – the 787 Dreamliner. This plane has more than 1,100 orders from 60 customers around the world. However, Boeing is also one of the largest US importers. To build the 787, Boeing sources parts from many countries. The 787 illustrates the nature of success in the global economy – countries and firms that do not source from the best in the world cannot export to the rest of the world. The foreign firm fallacy: “What’s good for General Motors is good for America,” a misquote in itself, became a slogan for many politicians. The underlying rationale is that US firms are better for the US economy in terms of producing and keeping jobs in the US. The truth is that US subsidiaries of foreign multinationals have an annual payroll of $510 billion with average wages of $80,041 – 30 percent higher than the national average. These foreign subsidiaries pay 14 percent of US federal corporate income tax, and produce $360 billion in US exports, about 26 percent of the total. Additionally, they spend $45.2 billion annually on US-based R&D activities, accounting for about 16 percent of all R&D performed by US companies. The reality of the global economy is that few major firms locate high-value activities based on nationality of headquarters. Such activities are based on local resource availability. So long as the United States remains a high-knowledge economy with valuable technological resources and innovation capabilities, it will continue to attract high-value-creating subsidiaries of foreign enterprises. Foreign firms in general, compared to local firms, source more locally, pay higher wages, perform more R&D intensive activities and export more. More importantly, they provide strong linkages for domestic firms to participate in global value chains. This leads to the last fallacy. The export fallacy: Traditional thinking about exports is that nations must sell to buyers in foreign countries. This was true when firms operated in silos set by organizational boundaries. This is no longer true in the modern economy dominated by global value chains. Different organizations add value at different parts of the chain. Thus, even though a firm may not be directly engaged in selling to a foreign buyer, it may be part of a chain that generates exports. There are three sets of firms within a global value chain – original equipment manufacturers, tier 1 suppliers and tier 2 suppliers. The original manufacturers ar e “orchestrators” who conceptualize the product and develop overall design. Manufacturing of critical components is then outsourced to tier 1 suppliers that specialize in specific parts. Those suppliers rely on tier 2 suppliers for components. Along with the orchestrators, tier 1 and 2 suppliers are integral parts of the global value chain. Domestic firms can thus become proxy exporters by supplying local or foreign orchestrators. In the aerospace industry, the design firm Sitec, by virtue of being a supplier to Spirit that makes airframes for Airbus, sells its product all over the world without directly dealing with foreign buyers or markets. Such indirect participation in a global value chain reduces the risks associated with direct exports while imparting critical learning that a firm can use if it decides to go international. 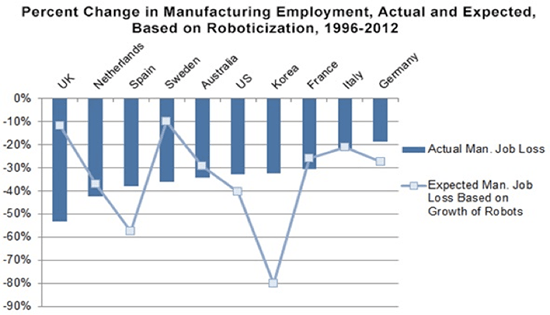 First, most value creation in advanced economies is based on services and not manufacturing. The sooner policymakers and the general public acknowledge this fact, the sooner the nation can focus on priorities that support robust economic growth. Second, the trade deficit is not always a bad thing and importing is often a key to exporting success. More importantly, limiting imports certainly won’t help in promoting domestic growth or reversing the trade deficit. Third, on average, foreign firms pay higher wages, have higher R&D-intensity and greater exports than domestic firms, thereby generating significant benefits for the domestic economy. Finally, connecting to a global value chain is a means of becoming a “proxy exporter” without the risks of international activity. *Ajai Gaur is Associate Professor of Strategy and International Business at the Rutgers Business School, Newark and New Brunswick. He is currently serving as the president of the Asia Academy of Management. He also serves as a consulting editor of the Journal of International Business Studies and as a senior editor of the Journal of World Business and the Asia Pacific Journal of Management. *Ram Mudambi is the Frank M. Speakman Professor of Strategy at the Fox School of Business at Temple University in Philadelphia, where he is the director of the Institute for Global Management Studies. He also serves as an editor of the Global Strategy Journal. I would like to comment on two issues. American people talk about trade but mostly the issue is about capital export. Many US companies are closing their doors and moving to foreign countries for more profits, lower taxes, and weak regulations relative to the US economy. It is also true that other countries are devaluing their currencies and providing export supports to make their commodities cheaper globally. Dumping has also been used. These issues do not represent free world trade. They are unfair practices affecting importing countries negatively, particularly on the employment level: job destruction. The authors have made another mistake. People are talking about more exports in order to cut trade deficit. US trade deficit indicates that imports are higher than exports and increased exports become a goal in order to balance the trade balance. This is a sound economic idea, which will increase the GDP and economic growth for cutting national debt and reducing unemployment. I have never heard that the American people are trying to use the Mercantilist idea that more exports relative to imports is the goal. Finally, if you listen to what Mr. Trump has been saying, for example, you can find that he is talking about manufacturing companies leaving the US economy and bad trade deals and practices of other countries against the US economy.